Replenish just-shaven skin with eShave White Tea After Shave Soother; a lightweight, quick-absorbing formula that works to hydrate and revitalise without greasy residue. Infused with Glycerin and Apricot Kernel Oil, the award-winning aftershave delivers long-lasting moisture and hydration, whilst soothing and calming to leave skin feeling comfortable around the clock. 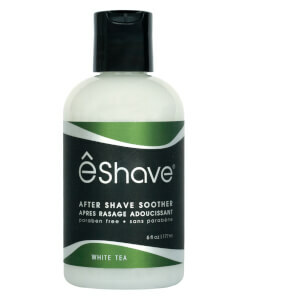 Skin is smooth and fresh with an invigorating White Tea fragrance. Massage gently to assist absorption. Use only a small amount to obtain nicely smooth and toned skin. Purified Water, Isopropyl Myristate, Stearic Acid, Apricot Kernel Oil, Glycerin, Propylene Glycol, Cetearyl Alcohol, Stearyl Alcohol, Fragrance Glyceryl Stearate, Tryethanolamine, Phenoxyethanol, Carbomer, Caprylyl Glycol, Potassium Sorbate, Hexylene Glycol, Tetrasodium EDTA, Benzyl Benzoate, Citronelool, Geraniol Hexyl Cinamal, Hydroxycitronellai, Hydroxylisohexyl-3-cyclohexene, Linalool, Limonene.